Well, we finally (and mercifully) reached the midway point of the 2014 Phillies season. Yesterday's two losses in the twin bill against the Braves gives them a record of 36-45, last in the NL East, nine games below .500, and on a pace for 90 losses. They rank 12th in the National League with a 3.86 team ERA, 11th in runs per game (3.86), 12th in team batting (.240), 12th in on-base percentage (.304), 13th in slugging percentage (.366), and 13th OPS (.670). As a result, the Phillies are the fifth worst team in the NL. The beauty of the the midway point is that it is easy to extrapolate individual results for the entire season. Beginning with the offense, here are the prorated numbers over 162 games. The leaders in each category are highlighted in red. Quick note: I feel like I have to mention that many of the descriptions below will reference figures in the present tense because it reads better and it won't give my high school English teacher a heart attack. The Phillies' older players have been surprisingly durable. All of the regulars age 34 and older are on a pace for 154+ games (excluding Ruiz). No Phillies batters will score 100 or more runs (Utley leads with 90). The Phillies have no 30+ home run hitters (Howard leads with 28). They have only one 100+ RBI man (Howard leads with 102). Individually, Ryan Howard is a borderline liability with just 28 home runs and 102 RBI. Those figures are certainly nothing to sneeze at, but for a player earning $25 million per year who has 200 strikeouts, cannot run the bases, and is a poor defensive first baseman, snot seems like the appropriate bodily function. For a quote-unquote power hitter, Howard ranks fourth on the team in both slugging (.414) and OPS (.727), behind Mayberry in both categories. All told, Chase Utley is by far the best hitter on the team, leading the team in hits (178), runs (90), average (.295), OBP (.355), and OPS (.809). The numbers for Domonic Brown are so bad I will not mention them. My only comments about Dobo are that he was compared to an equally unmentionable name by Matt Gelb. That name is Steve Jeltz. In other notes, Jimmy Rollins is well on his way to leading the team in walks, and his 76 walks destroy his previous season high of 62 in 2012. I have to eat my words a little on John Mayberry, who has been very productive this season. He is hitting just .224, but he ranks third on the team in slugging (.430) and OPS (.755). The Phillies have the 9th best pitching staff in the National League with a 3.95 ERA, which is not half bad considering Cliff Lee and Cole Hamels missed a combined 11 starts thus far this season. Cole Hamels is having his best year since 2011 and is on pace to finish with his second best season ERA (2.84), only trailing his 2.79 ERA in 2011. He leads the team in ERA (2.84), strikeouts (182), hits per nine (7.7), strikeouts per nine (9.2), and WHIP (1.184). There's not much else of note, other than durability of AJ Burnett. The man pitching with a hernia is set to lead the team in starts (34) and innings (222.0). 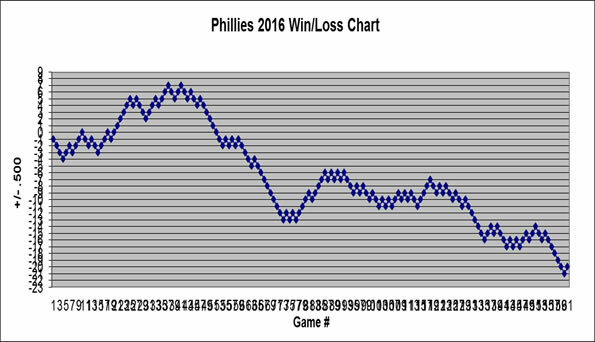 If there is reason to be hopeful for this Phillies team, it is the performance of the bullpen. The Phillies' bullpen ranks 12th in the league with a 3.66 ERA, but they have been dealing for about a month. In their last 28 games prior to yesterday's doubleheader in which they allowed 8 earned runs, the 'pen has a 1.78 ERA. Jonathan Papelbon, after a difficult 2013 season, has been one of the best closers in baseball, accruing a 1.44 ERA and he is on pace for 36 saves and just 4 blown saves. Jake Diekman has become Sandberg's go-to guy this season, leading the team with 74 appearances. While he is still an unfinished product (as his 4.25 ERA will attest to), he is on pace to strikeout 96 batters at a rate of 12.0 per nine innings. The other pleasant surprise is Ken Giles, who has kept his walks under control and is showing the dominant stuff we hope to see for years to come. He leads the team in ERA (1.29), hits per nine (2.6), strikeouts per nine (15.4), and WHIP, (.714).